A new report looks at the supply and demand for higher-level skills, prompting Kate Purcell and Peter Elias from the University of Warwick to ask if we now have too many graduates. This is from the Conversation. So the Professors Purcell and Elias seem to be suggested there is at least a mismatch between higher education and the demands of the employment market. Is that good enough? Should we not be expecting a degree – which comes at a huge cost – to be delivering skills that directly increase employability as well? Are we producing too many graduates? 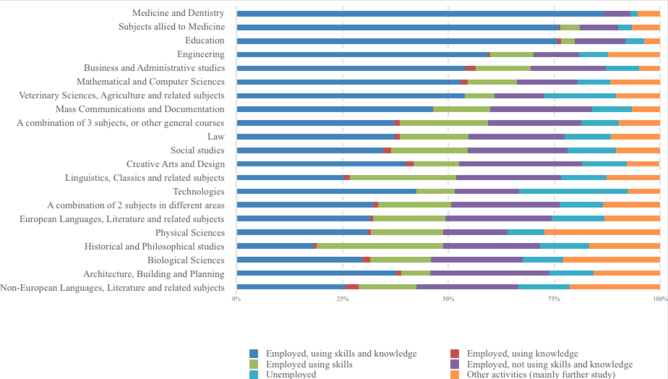 Categories: Employment, Higher Education, and Research. Tags: Employment, Graduate employment, Higher education, Research, universities, and Universities UK. There will be an oversupply of graduates globally in relation to the jobs market. It’s not just in the UK where graduates can’t find employment which matches their qualifications. That’s not to say there should be fewer graduates but that young people should be made aware of the other benefits which accrue from higher education. SchoolsImprove #GreatEducationHoax runs on assumption that knowledge of Motte & Baileys a Good Thing for diplomats & dole takers alike.